Leaving their mark on the history of the region have been an intriguing mix of Middle Stone Age man, indigenous Khoi people, ostrich Feather Barons, woodcutters, farmers, gold-diggers, merchants, sailors, craftsmen, ordinary folk even intrepid explorers such as Portugal’s Bartholomew Diaz who landed at Mossel Bay in 1488 as well as a modern day diverse mix of tycoons and artists. Plettenberg Bay’s Nelsons Bay cave on the Robberg Nature Reserve and Matjes River Caves were inhabited by Middle Stone Age man for over 100 000 years with the Khoisans leaving a legacy of tools and ornaments. Deposits of their tools, ornaments and food debris can be viewed in these caves which are still being excavated. One can also observe the geological changes over the past millions of years which affected prehistoric life. Stilbaai, at the coast, boasts shell middens which date back 3 000 years, not to mention an abundance of fish traps. The presence of Blombos Cave, where it’s believed that man first thought abstractly, is a further feather in the Garden Route and Klein Karoo’s history books. What’s interesting about this cave is the constant occupation of humans except for between 40 000 and 20 000 years ago because of the harsh living conditions they found themselves in around that time (it was during the last Ice Age, and the sea level dropped 130 m and the coast was about 100 km offshore). It basically shows us from about 115 000 years ago to about 300 years ago, and during these times we see changes in the artefacts they use. This site was discovered by Ray Inskeep who started some work on it in 1964. He found Middle Stone Age (MSA) tools near the bottom of the pit. 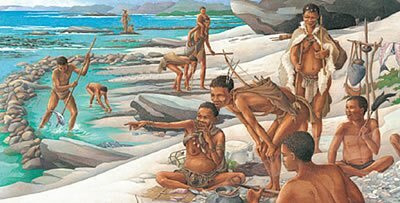 The cave dwellers ate a variety of food, from plants to sea food as many shell middens were found, dating back to about 5 000 years ago (and all the older ones are believed to have been washed away or have been covered by the water when the sea levels rose). 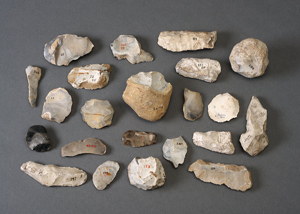 There is just so much that this site can offer as to understanding how we got to be; it basically deals with all the tools our ancestors might have been using all those years; right from the Stone Age tools, right up to the pottery they used about 2 000 years ago. The burial of the dead is also seen near the mouth of the cave. The buried are found in a foetal position, ornamented with shells and ochre. This clearly shows that caring for the dead started a long time ago. 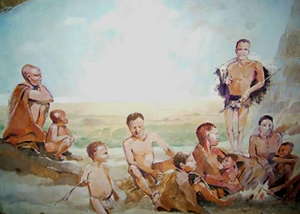 The burying of the dead also helped scientists in that they could now study the diet of these cave dwellers by looking at their teeth, and these kinds of studies help in reconstructing the palaeo-environment of that time. Fabulous, what a web site it is! This website gives helpful information to us, keep it up. Hi there! I’m at work browsing your blog from my new iphone 4! Just wanted to say I love reading your blog and look forward to all your posts! Keep up the outstanding work!